While folks in the Southern Hemisphere of our globe pull out their Winter teas, those of us in the Northern Hemisphere seek teas that are more soothing for those hot days ahead. That Summer tea line-up will be essential for your daily comfort. 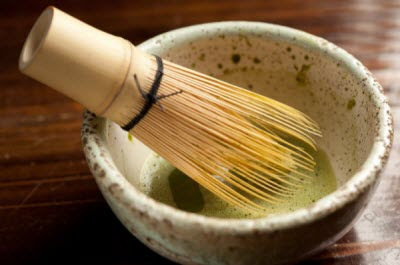 Matcha — Simple to make. Tasty and versatile. Drink it straight or add honey or other flavorings. It is used in a variety of recipes, including as a flavoring for ice cream. The one shown here is 1000 mesh (1000 tiny holes in the screen per square inch which is about 0.013 millimeter per powder in diameter). Premium Bao Zhong (PouChong) Tea — It’s the natural floral aroma of this Taiwanese oolong that makes it a cooling tea. Add to that the bright yellow-green color of the liquid and the lightly sweet undertone to the flavor. Try it served chilled for a different taste experience sure to beat that Summer heat. Raw (Green) Pu-erhs — There is a sizable variety from which to choose. This one is a limited addition but worth seeking out: 2007 Xiaguan “FT” #4 Premium Raw Pu-erh. You can steep it and savor while listening to the rain falling outside. The thick gold-yellow liquid has a pungent aroma characteristic of Xiaguan teas and an aftertaste that is sweet. Yunnan Black Tea — Try 2011 Spring Imperial Yunnan Fengqing Golden Buds Black Tea. A delicately flavorful Yunnan black tea is in my mind a wonderful choice for those rainy Summer days (or even nights). It has a freshness and sweetness that needs no sugar or honey to hide astringency present in many black teas. Yellow Tea — This slightly oxidized tea tends to be relatively low in caffeine and is also fairly gentle on the stomach, so a cup in the evening is a perfect soother. Try 2012 Imperial Meng Ding Huang Ya with its non-grassy flavor and flowery, fresh aroma. Dancong Oolong — The floral fragrance and long, sweet aftertaste will make that muggy evening seem so much more comfortable! This tea also has an almond aroma that is a testament to the processor’s skill. Hope these help you enjoy the Summer even more! This entry was posted in Uncategorized and tagged chinese tea, JAS-eTea, summer. Bookmark the permalink.